On September 11, 2001, at 8:45 AM EDT, hijacked American Airlines Flt 11 from Boston crashed into the north tower of the World Trade Center in NYC. At 9:03 AM EDT, a second hijacked airliner, United Airlines Flt 175 from Boston crashed into the south tower of the WTC. Both towers collapsed and killed nearly 3,000 people and injured over 6,000 others. Video frame from CNN. 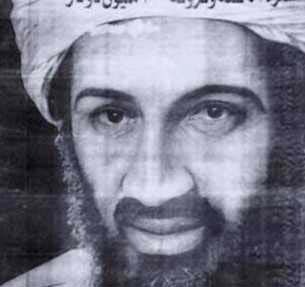 Osama bin Laden, organizer of the Al Qaeda Islamic terrorist group and son of Muhammad Bin Laden, owner of the large construction company, Bin Laden Group, in Riyadh, Saudi Arabia. Photograph from Middle East newspaper. September 15, 2001 Philadelphia, Pennsylvania - The horror in New York, Washington and western Pennsylvania this week has not only changed the psyche of our nation - it changed air travelers into potential enemies and airports into much less friendly territory. I know that from personal experience yesterday morning at the Philadelphia Airport. I was scheduled to fly to Dallas on a 9:17 a.m. flight in order to attend a conference. But when my alarm went off at 5:30 a.m., lightning and thunderbolts were dropping around the house like bombs and the hard rain turned the Pennsylvania Turnpike and I-476 to the airport into a slow moving traffic jam. A trip that would normally take about 55 minutes, took 2 hours and 20 minutes.